Someone once told me they liked my darker dresses more than the conventionally pretty ones; the truth is, I do too, but conventionally pretty is easier to knock out when it’s 7:30 PM, I haven’t even started to think about what to draw (always much harder than the actual drawing) and I still have to make dinner too. But I resolved to do some darker dresses this Halloween, so we shall see how I do. I’m not the only one who has a hard time breaking free of conventionally pretty clothes. The owner of this dress — sorceress? evil queen? both, actually, as she had an unconventional career trajectory — has deeply buried attachments to such dresses from her days as a beautiful princess, as good and uninteresting as the day was long, and she never quite lost her taste for some of the elements: the tight bodices, the poofy skirts, the splashes of color and lace. Now, a dress like this she couldn’t wear in front of fellow evildoers and retain her self-respect, as there’s just a touch too much fragility in the bow at the waist, too much domestic modesty in the long sleeves, too much girlishness in the full skirt and not even a creepy pattern in the fabric of the underskirt. It could be saved by a dramatic collar that jutted out inches past her shoulders and soared to her ears, but she just can’t bring herself to put it on and ruin the neckline. So she wears it in the privacy of her own chambers, although I cannot say she does anything so sentimental as reflect on her past life — I cannot say if she can still remember her princess days, to be precise — and if she suspects a henchman of giggling at her, she guts him like a fish. You will hear more about her later in the month, if all goes well, and see some of the clothes in her wardrobe that better fit her twisted crown. But practice your poker face in the meantime, so she doesn’t think we’re making fun of her. fun story!!! dress is cool,too…cann’t wait to see more!!! ohhhh I’ll have to be real careful around her. Can’t wait to see the rest of her stuff though. Maybe if I’m just amazed at her fabulous crown she’ll like me? I love the shine on the ribbon! My kind of gal. I love that twisted crown. just found this site randomly searching for masquerade ideas and it may be a new favorite of mine :) u r very talented! I love this dress. 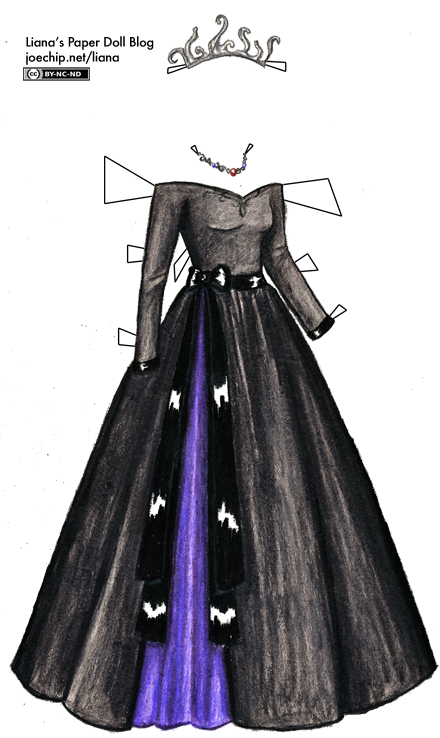 Full skirt, overskirt, black and purple…if I didn’t think people would look at me funny I’d wear this kind of dress all the time! I would totally wear this dress! Okay I have been admiring your paper dolls they are lovely this may sound like a weird question but what do you do with them… ie do you do with them?? Yay! I like this dress! I agree with Emily, if it wasn´t for the strange looks people would give me, I could wear this kind of clothes all the time! Actually, I have sort of a paperdollblog myself. It would be fun if you looked at it! My drawing isn´t as yours, Liana, but I think it is fun to make clothes! Seems like I´m using your blog to get readers to mine, but actually, it is you who gave me inspiration to begin! I saw the picture and thought, oh, it’s like a princess at a funeral, desperately wanting to wear bright pinks and purples, but forced to have black. I like your explanation of the colors clashing with the style/cut of the dress. I feel like the crown really saves the evil sorceress image, add some dramatic black curls and fiery eyes and that’s a pretty scary woman! I must say, this seems to be more of a vampire princess kind of get-up. omgosh !!! i love this dress but it will be better with short sleeves and the story is really intresting…i love it … i would like to have one like that..